History of Ireland ring is a unisex design that is cast in sterling silver. This History of Ireland ring is retired and we are limited to stock on hand. This sterling silver History of Ireland ring measures 8mm wide and it is suitable for both women and men. 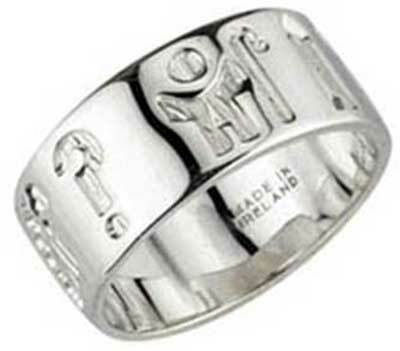 The History of Ireland ring is gift boxed with a legend booklet that explains the symbolism that is engraved on the band.